Suspended cabins for writers, Fondation Jan Michalski. 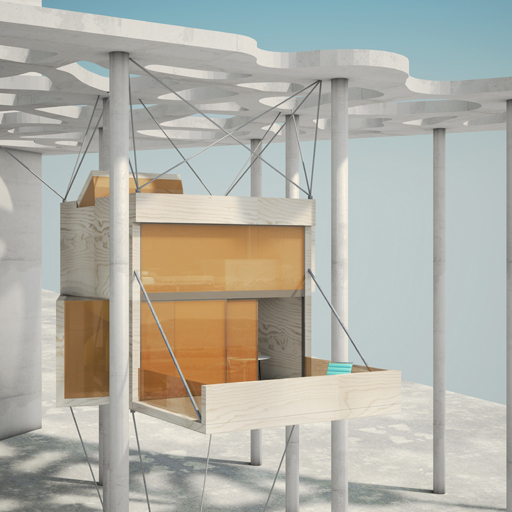 The poetically charged impulse for the “flying” cabins for writers is arresting. Under normal circumstances one would expect to find cabins dotted in a natural forest. In the House for Writers, however, they are hung in a large number from an organically flowing roof structure amongst an abstract forest of concrete trunks, oscillating between a crown of leaves and the water surface below, and creating something like a writers’ village. The aim is to provide the writers with a refugium – a living and working space that lends itself to reflection. Suspended in midair, this living space is at the same time exposed but nevertheless allows the writer to remain undisturbed. The proposed project takes this academically constructed situation, its charms and its ambivalence as its topic and its source of reflection. The cabins create a contrast to the organically formed concrete structure, and in their closed-up and unoccupied form are conceived as calm, abstract wooden cubes. As a series this enables them to form an architectural, almost urban overall image. The cube itself symbolizes a man-made geometrical artifact set down within untamed nature. When occupied the individual unit undergoes a metamorphosis that can be likened to a butterfly cocoon. Like a living creature it unfurls and transforms itself through the opening of its hatches, windows and skylights, and begins to breathe. A terrace can be formed by letting down a wooden element. This individual transformation and modulation to each of the writer’s own personal needs – light, openness, enclosure, etc. – makes each cabin unique, intended to provide each writer with his or her ideal environment. A minimal but nevertheless varied special world opens up inside the unit, with a partially double-storey living area and a gallery with a sleeping area reached via a spiral staircase. Where required the glass elements are tinted orange to provide a degree of visual seclusion. This shading is one-way, and the orange is invisible from inside, providing a clear view from the inner to the outer world. The design acts like a book: a book must be opened and read in order to experience its content.